This is a blog about Anne Frank, but it starts with human rights advocate and Bard College professor Helen Epstein. Last night, I heard Helen speak at the Pulitzer Center about her new book, "Another Fine Mess: America, Uganda, and the War on Terror." Helen shows how Ugandan President Museveni has spread chaos throughout the region, worsening conflicts in Rwanda, Sudan, and Congo—all the while glorified and aided by the U.S. The consequences have been nothing short of horrifying. And yet, Helen tells us, Museveni continues "to tighten his grip on power." I paid close attention to Helen's talk given that our daughter Ida lived in the DRC for eight years and is now the Central Africa Director for Human Rights Watch. But Helen and I share more than an intense interest in this region. As I told Helen last night before her talk I am a longtime admirer of her mother—Barbara Epstein, the co-founder and editor of The New York Review of Books—a position she held for 43 years until her death in 2006. In the many warm tributes to Barbara Zimmerman Epstein [NYR, August 10] no mention is made of one of her earliest great contributions: in 1951, the twenty-four-year-old Barbara Zimmerman, then at Doubleday, was asked to edit The Diary of Anne Frank. Publication in England and the United States had been a long time coming. The book first appeared in the Netherlands in 1947 with the title Het Achterhuis, meaning “The House Behind.” It was later published in France and Germany, but finding a British or American publisher had not been easy. Otto Frank, Anne Frank’s father, received numerous rejections. Carol Ann Lee, author of The Hidden Life of Otto Frank, tells us that Frank Price acquired the manuscript for Doubleday, but he had to read it twice before becoming enthusiastic. Ms. Zimmerman was the same age Anne would have been were she alive. This must have been a contributing factor in the close relationship that developed between her and Mr. Frank. When he told her that he would like Eleanor Roosevelt to write the introduction, Ms. Zimmerman followed up. Written by a young girl—and the young are not afraid of telling the truth—it is one of the wisest and most moving commentaries on war and its impact on human beings that I have ever read. Anne Frank’s account of the changes wrought upon eight people hiding out from the Nazis for two years during the occupation of Holland, living in constant fear and isolation, imprisoned not only by the terrible outward circumstances of war but inwardly by themselves, made me intimately and shockingly aware of war’s greatest evil—the degradation of the human spirit. At the same time, Anne’s diary makes poignantly clear the ultimate shining nobility of that spirit. Carol Ann Lee believes it was Ms. Zimmerman who wrote the introduction to which Mrs. Roosevelt gave her name. I find the tone of the introduction slightly more formal than the casual, conversational tone Mrs. Roosevelt adopted in her “My Day” column and her other writing. Still the sensibility and the thoughts expressed in the introduction must have been shared by both Ms. Zimmerman and Mrs. Roosevelt. I think it is well for us who have forgotten so much of that period to read about it now, just to remind ourselves that we never want to go through such things again if possible. Her story ended tragically. 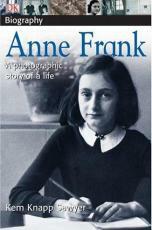 She died in the concentration camp at Bergen Belsen. This diary should teach us all the wisdom of preventing any kind of totalitarianism that could lead to oppression and suffering of this kind. In the years following publication, Mr. Frank received 30,000 letters from readers. The Diary was translated into sixty-seven languages and more than 31 million copies have been sold. It is a book that has touched many hearts; let us pay tribute to wise choices and graceful editing.